Hill End Family History (in conjunction with Hill End & Tambaroora Gathering Group) are holding an Open Day in Hill End at the Royal Hall. Come along and see what resources are available for researching your Hill End and Tambaroora ancestors. At its peak in the 1870, there were more than 7,000 people in this rich goldmining area, half way between Bathurst & Mudgee. They are not all in our cemeteries as many moved on to all parts of Australia. Was your ancestor one of them? Speak with our enthusiastic volunteers who can help you along the journey. 2pm: Launch of the Hill End & Tambaroora Gathering Group’s updated website by Bathurst Mayor, Mr Gary Rush. The revamped website is now a goldmine of information, thanks to more than 2000 hours of work in transcribing old records by a keen group of volunteers. 3pm: “Captain Augustus Baker (Gus) Peirce: Steamboat Captain, Goldfields Entertainer, Miner and Artist”. During his stay in the Hill End district in 1872, Gus also spread his talents to Rylstone. In an illustrated talk, Virginia Hollister, from Rylstone and District Historical Society, will explore the activities of one of the district’s lesser known, but more colourful and talented characters. 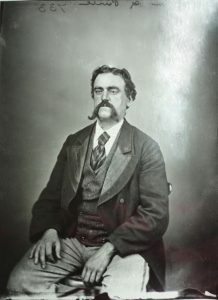 In researching Augustus “Gus” Baker Peirce, who brought his Varieties Tent theatre to Hill End during these exciting goldrush period, Virginia was introduced to this multi-talented riverboat Captain who turned his hand to many undertakings including acting, mining, and surveying, and who often paid his bills with his artwork. The conservation of one of his murals in Rylstone and the research into the artist brought many elements together beautifully for Virginia. With a love of history, art and photography, and of old buildings, she embarked on a great detective story in order to unravel the symbolism in the mural, only to be distracted by this fascinating American artist/entertainer/entrepreneur along the way. She will be sharing her research journey on this fascinating topic in her talk.